Honestly, 2017 went by in a blink of an eye. I cannot believe it is almost December. For me personally, this year has been a challenging year with hard and bone-deep lessons. I was called to ride the waves of my grief and losses, as well as face my inner demons at a cellular level. Phew. It's been a thunderous heck of a year, and my deck of cards (khem, my numerous decks of cards...#notadeckjunkie) has been absolutely crucial in aiding my journey of self-discovery, self-love and healing. "At the Edge of the Woods" The spirit of the wood greets you, ready to take you on a journey. What is your purpose in entering this dream-space of deep contemplation and reflection? "The Path into the Woods" What will help you navigate your journey as you traverse through the moonlit paths of your innerscapes? The Wind in the Trees": What are the energies that surround you? "Reflections": What do you see in yourself? "Relic from the Forest": What is the wisdom that you must take with you when you leave the Woods? "At the Edge of the Woods, Once More": How has the Woods or this Inner Journey transformed you? The Beginning: What were your visions and hopes at the beginning of the year? The Story of 2017: What is the overarching theme that defined the year of 2017? Challenge: What are the challenges that you had to face, the shadows or ego-based tendencies that you had to overcome in 2017? Lesson: What did you learn this year? Power-Up: What gave you strength? How did you power through the difficulties and challenges? What was your source of confidence and empowerment? Build: How can you use the powers you have "upped", the lessons that you've worked through, the wisdom that you've gained to get ready for next year? 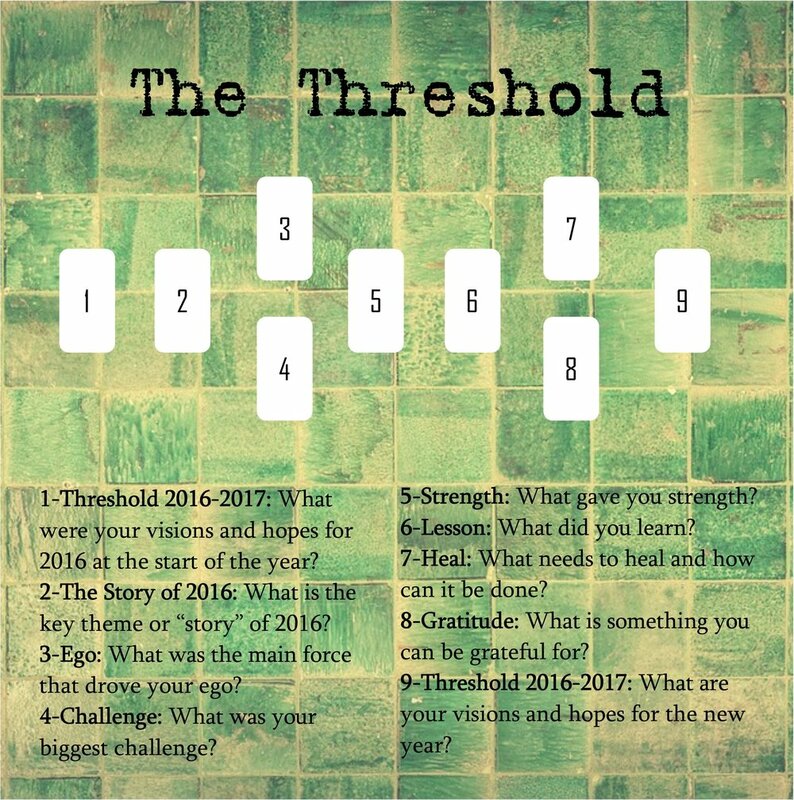 Threshold of 2018: What is ending--and what is beginning? What are the new energies that are coming in for 2018? 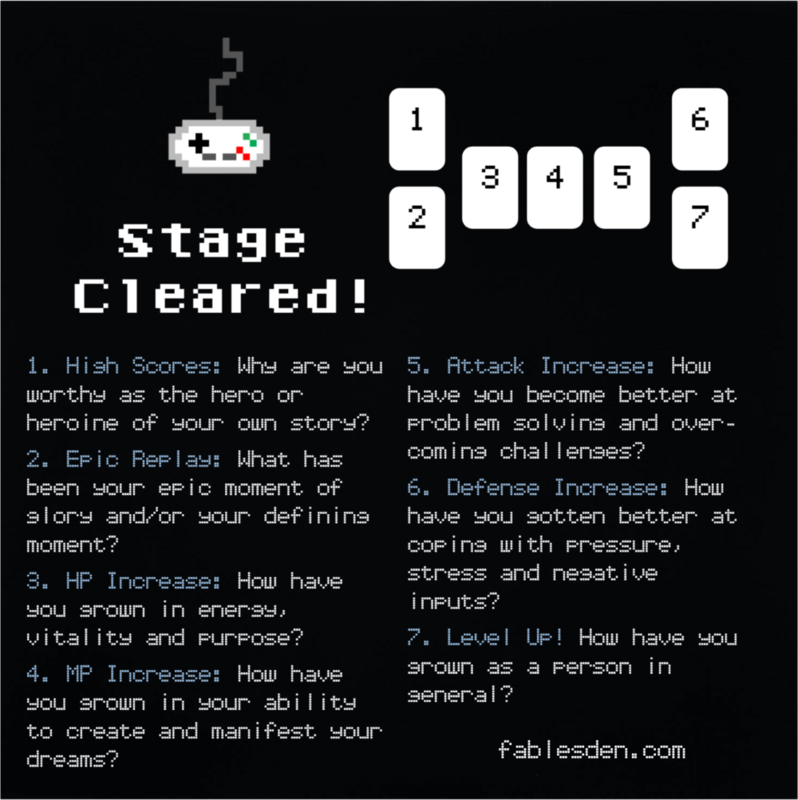 High Scores: Why are you worthy as the Hero or Heroine of your own story? Epic Replay: What has been your epic moment of glory and/or your defining moment? HP (Health Points) Increase: How have you grown in energy, vitality and purpose? MP (Magic Points) Increase: How have you grown in your ability to create and manifest your dreams? Attack Increase: How have you become better at problem solving and overcoming challenges? Defense Increase: How have you gotten better at coping with pressure, stress and negative inputs? Level Up! How have you grown as a person in general? …a spread for examining the various areas of your life. 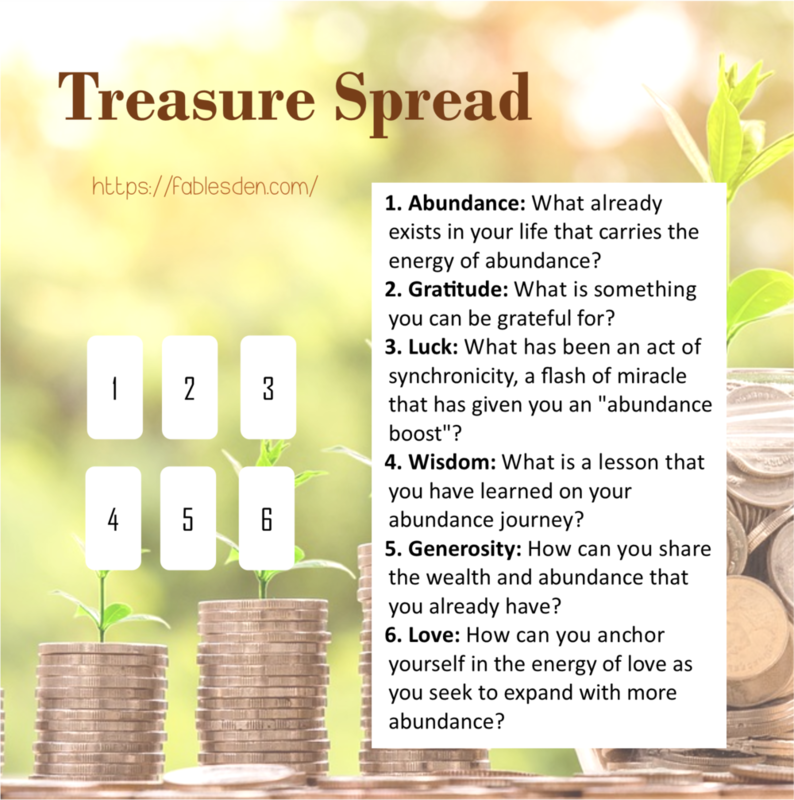 This spread can be used in many ways, depending on the overall theme that you would like to address. For example, you can use this spread as an annual "report" spread to get a general idea of how you did with each category. You can use this as a trouble-shooting spread and draw cards to see how you can level up in each area of life. You can also do a gratitude-themed spread and pull cards for things that you can be grateful for in each area. Other suggested themes: ups and downs (draw 2 cards for each category), things in need of releasing, things in need of healing, advice, weekly/monthly/bi-annually check in's, etc. The Blackhole: What has been a negative experience/source of negativity that is draining the life out of you? Filtering Suckage: How can you release and process the negativity? Extracting Energy: How can you grow from these negative experiences? What is a lesson you have learned and what is something useful you have extracted from this pool of negativity? Good Energy: What is a source of positivity that you can maintain or already have? 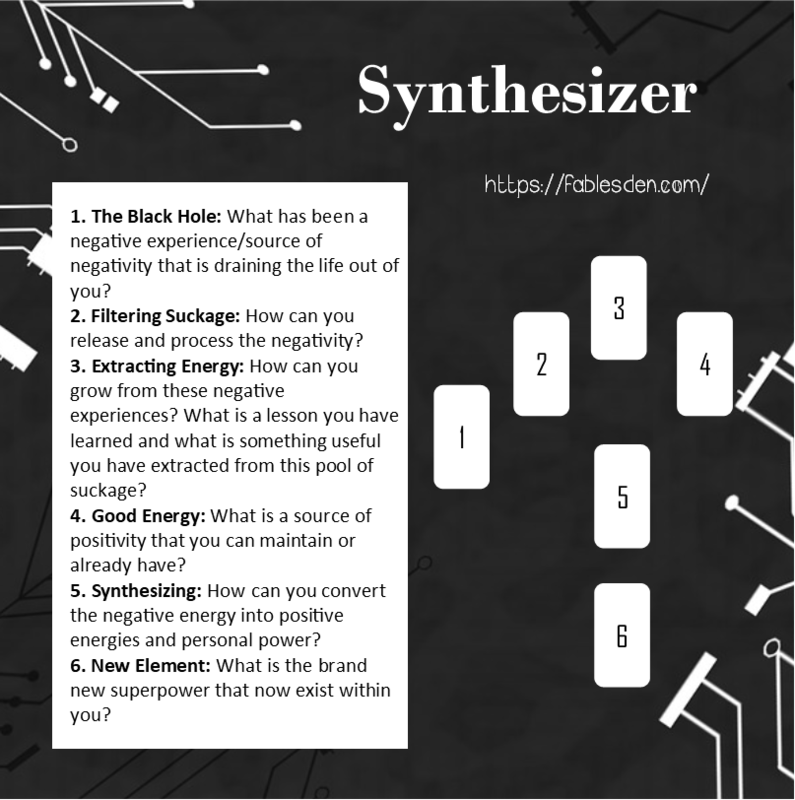 Synthesizing: How can you convert the negative energy into positive energies and personal power? New Element: What is the brand new superpower that now exist within you? Abundance: What already exists in your life that carries the energy of abundance? Gratitude: What is something you can be grateful for? Luck: What has been an act of synchronicity, a flash of miracle that has given you an "abundance boost"? Wisdom: What is a lesson that you have learned in your abundance journey? Generosity: How can you share the wealth and abundance that you already have? Love: How can you anchor yourself in the energy of love as you seek to expand with more abundance?